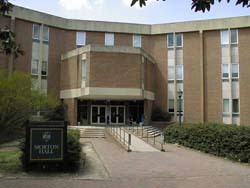 Morton Hall is located at the intersection of Jamestown Road and Campus Drive. From College Corner (the 'V' intersection of Jamestown and Richmond Roads), proceed west past Phi Beta Kappa Circle and turn right into the next parking area. Morton Hall lies directly ahead ... you may want to print out a map of campus. Visitors are encouraged to obtain a Visitor Parking Pass, available from Parking Services at 201 Ukrop Way. With a Visitor Parking Pass, you can park in any campus space designated for visitors, faculty/staff, or students (unless restricted "at all times"); and, if appropriate, at any space reserved for the disabled.